A word to my sister – LOOK AWAY NOW! 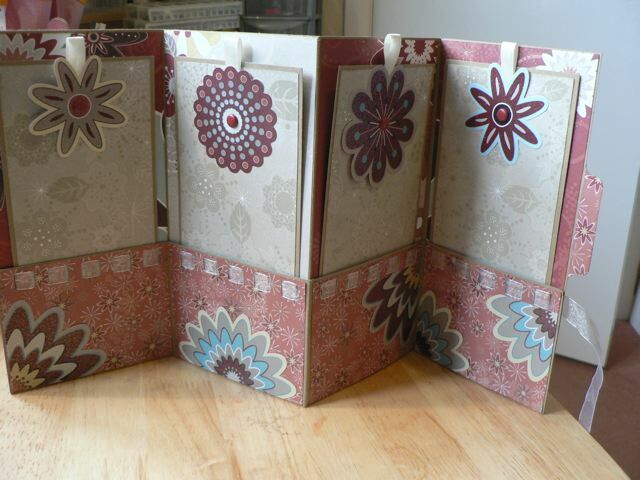 You may recall a little kraft-folder book I made a while back using some folders I got at Staples. I wanted to make a little gift book for one of my nieces to give to her when we see her (soon, soon!) and I did! Started at a crop yesterday, run by Bev of Banana Frog , it (quite shamefully) doesn’t actually include any stamps but I think my next one will! I will also probably have to do a little video for it, although I suspect the vast majority of my YouTube subscribers are actually in the USA and not the UK I am thinking I will have to bring back a pack of manilla folders and work out how to do one in that size as well to avoid frustrating people who can’t get A4 folders. I used some paper I had laying around (I think it was sent to me by Scrapbook Inspirations, probably intended for use in a feature that never came to be once the mag folded) from Cloud 9 called Cinnamon Stick. 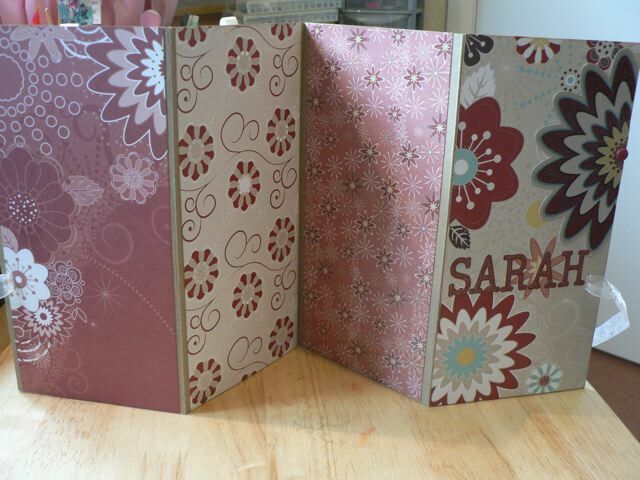 I also had a set of glittery die cuts that I used. The little clip just holds the left side of the book closed as the ribbon tie really doesn’t. I can have wrapped the ribbon around and tie it on the left, which works better, in reality, but not with her name where it is. That was placed as it was to use the open area of the patterned paper on the cover, but I always learn something, and refine my projects with each one I make. So next time I will take this into consideration! Something else I did on this one that seemed a good idea at the time, was to stick down the sides of the pockets. Still a good idea, but it does mean the “tags” need to be thinner to accommodate – and the middle two are slightly wider than the outer two, as the way the ribbon threads means the outer two pockets are just that smidge smaller widthwise. All part of the learning curve! Each tag can hold one or more photos, depending on the size, and additional photos can easily go on the body of the folder behind the tags. I really didn’t want to force any particular sizes by adding photo mats so I will leave that up to her. 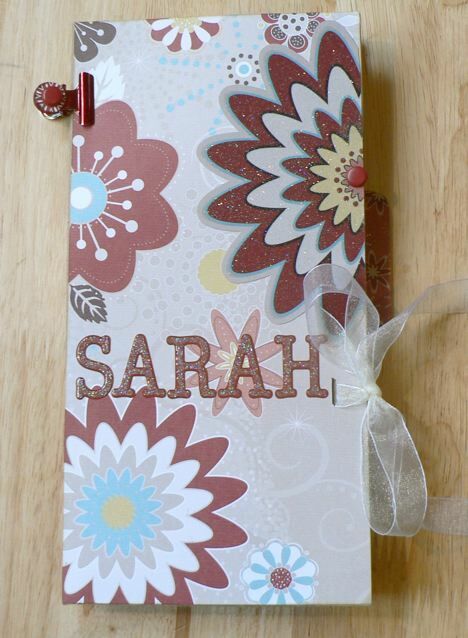 The back is just plain patterned paper – fine for adding photos or leaving it as it is. One thing I have been using a lot recently is this site. It’s been on the UKS Homepage and is in the Library entry on printable papers. I love it to death! You can make a variety of selections, like style of grid, size, colour of lines, then generate a PDF which will download to your computer. The PDF is either 150 DPI for graph paper or in the case of the storyboard paper, 300 dpi, so very easily edited in something like Photoshop. The papers are great for journaling blocks, all the lines are spaced properly, and in this case the storyboard spot makes a nice place for another photo. The storyboard is nice as it gives you a block at the top with journaling lines under it. I played around with many different set ups to get just what I wanted (and then had a further play and got something I really liked better, but wasn’t going to take the whole thing apart to replace what I had!) then printed it onto ivory cardstock to back each of the tags. So what SHOULD happen when you click this is you will get the .jpg which you can use (like the tags from the other day the lines LOOK patchy on the screen but print fine). It should print at 3.5 x 8 but you can resize it. I made this one black although the one on MY tags is actually a sort of maroon-y brown to match the paper – I thought the black was more useful. Better still have a play on the site. 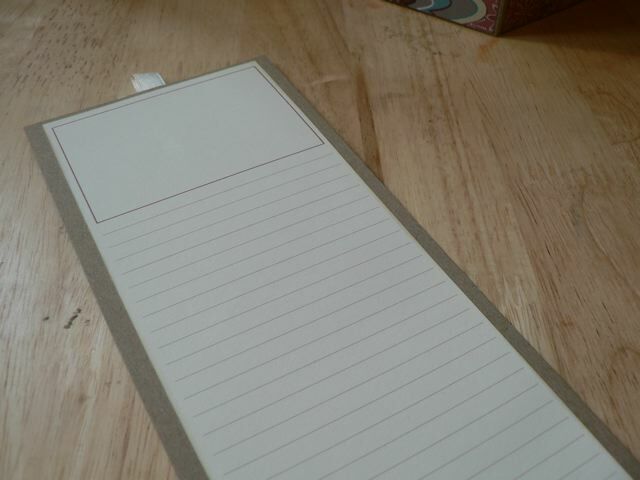 By setting the columns and rows you can force the box bigger or smaller and thus the journaling lines longer. There is a bit of waste at the top and a bit of site advertising at the bottom, but I just made mine bigger than A4 then test printed it to see what came out. But in the end I did mark one of the columns of the PDF and copy it over to a new Photoshop file where I could delete the empty bit at the top and the site advertising at the bottom then fill a 12 x 12 file with the strips and print. Categories: mini-albums, Photo manipulation | Tags: folders, mini-albums, technology & scrapping | Permalink. It looks stunning. I definitely want to try this!